As management, marketing and economic industry consultants G. P. Wild provide business advice and consultancy in a variety of specialist areas with the focus being on the cruise, ferry and maritime tourism industries. Current clients include a wide range of ports and destinations. P. Wild is an authoritative source of cruise industry statistics and publishes a number of leading reports and industry reviews. Our comprehensive database and experienced research team are always available for your statistical and analytical needs. G. P. Wild specialises in marketing, maritime management, cruise management, business planning and strategic business development applying these skills to many different situations. Such work frequently assists with structural change or focuses on new concepts and innovative ideas often in a fast moving and dynamic environment. 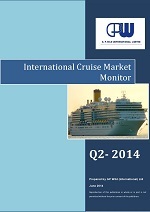 The Monitor includes exclusive cruise market data, industry statistics country specific reports and business reviews as well as a quarterly summary of all the latest cruise news and port and cruise company developments. For less than £1.40 a day the Monitor keeps you informed with exclusive industry research reports and in depth market information. The annual subscription of just £495 represents outstanding value for money. For more information about our maritime, ferry and cruise management and consultancy services please don’t hesitate to contact us today.